And while there are simple steps to get started such as launching recycling programs and changing shipment routes so they are more efficient, “greening” the supply chain can go further by sourcing sustainable suppliers and even re-engineering products to include sustainable materials. 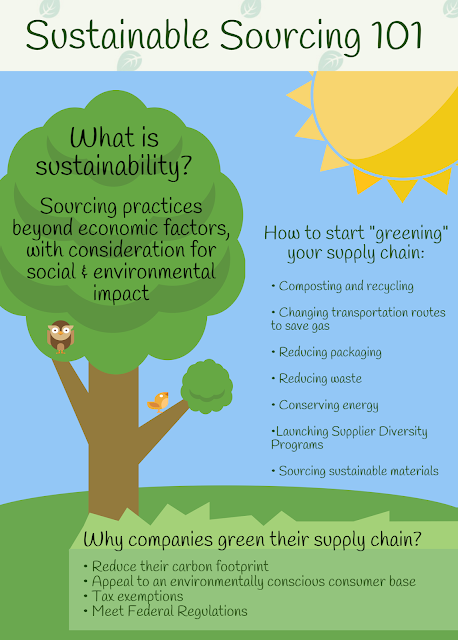 Don’t let the thought of eco-friendly sourcing scare you into thinking higher costs. Our goal is to educate companies on the truths of sustainable sourcing and how costs more often comparable. Through our vigorous research and negotiation tactics, we’re able to challenge this notion and provide our clients with affordable sustainable options. This is especially true if you evaluate the total cost of ownership for the materials or products they sell (e.g., - disposal costs, green or carbon credits, tax rebates for energy efficiency, product resale values). We work to provide the market intelligence necessary to help our clients make well-informed decisions that make it possible to support their sustainability goals and their spend management needs. Last week, Source One’s Associate Director, Jennifer Ulrich presented to students at Immaculata University on the topic of sustainable sourcing, including the motivations behind companies “greening” their supply chain operations, and Source One’s role in achieving their sustainability goals. Ulrich took the opportunity to leverage her experience and shared with student actual case studies of sustainable sourcing projects. Special Thanks to MRA Global for their contributed sustainability content.